Blogging Aimlessly, that pretty much sums up my past blogging experience. Just writing blog posts, optimizing for keywords, and waiting for the errant visitor to come happening onto my site. If this sounds vaguely familiar, what are we going to do about it? Sure you can keep cranking out posts and hope one day you hit the mother load. You’ll be on top of the Google SERP’s, and everyone doing a search for that elusive keyword you are targeting will be sure to stumble upon your blog. We can come up with a strategy for our blog? Or, we can just pack it in, quit, and call it a day. Nothing is over until we decide it is. Was it over when the German’s bombed Pearl Harbor? — Hell No! In Field of Dreams, it was as simple as building a baseball diamond in a corn field. OK, maybe that’s not a good analogy, as that actually sounds kind of difficult. What I’m trying to say is, if you build a blog, nobody is coming unless you have a strategy in place. If you want to keep writing for yourself, have at it, but I have better things to do with my time. You can have the best idea in the world, the greatest theme/design ever implemented, and content that rivals some of the biggest blogging names on the planet. How are you going to get people to find you? With a strategy, that’s how!!! The easiest way to implement a strategy is to find one that works for successful bloggers and use that strategy for your blog. Now I know what you’re thinking, why in the world would a successful blogger share their strategy with me? This is the beauty of blogging. I’m discovering there are so many bloggers out there that want you to be successful, and they are willing to share their secrets completely free of charge. How’s that? They write about it on their blogs! The thing is, these aren’t really secrets. It’s all common sense. You see, most new bloggers go about this the wrong way. They write their content, optimize it for the search engines, share it on their social networks, and wait for people to come. Build it and they will come. The problem is, nobody ever comes. So how do we go about finding a strategy to use? Start visiting some of the popular bloggers. They’re all writing about it. You’re probably not even realizing it. Notice anything unique about the above list? These are all things that go on outside of your own blog. This is all part of their strategy, and you know what? It works for them. Take note of the number of comments they have on their posts. How many people are following them on social networks. You want that for your blog? You need a strategy. Not just any strategy, you need their strategy. As a project manager, I’m smart enough to know that everything starts with a plan. Without a plan, you’re asking for failure. To bad it took me this long to figure out that same principal applies to blogging. Here’s the 7 activities you need to focus on to get your blog on the right track. I’ve broken these out into activities which in turn consist of a number of tasks. In project management terms, you have a parent task which are than broken out into sub-tasks. It’s time to get your house in order. After all, you’ll be expecting lots of company. You don’t want your new visitors to see your place in shambles do you? Clean up your existing content — is your copy presentable to new readers, does it contain sub-headings, what about images? It’s never to early to start networking, and this is one of the first things you should be focusing on. Your blog is dead without the help of others, and you’re going to need this help when we get into some of the following activities. While you are networking, it’s time to start creating some top notch content for your site. Now’s the time to bring your A-Game, and write like you’ve never written before. Remember – quality over quantity. A few pieces of high-quality content will go a long way. Once you have a few posts published, now you can focus on your email list. We want to make sure you are in a position to convert the visitors to your site to subscribers. Why? Well for one, your email list will contain the names and email addresses of those visitors that will truly be engaged on your site. They like your content and want more. This is your opportunity to target them with weekly or monthly newsletters, and opens up a variety of options for you. Second, when you decide to start offering other products or services (revenue streams), you already have a list of potential customers. Find the right service. If you are just starting off, I recommend MailChimp, as they have a free option. You can always upgrade this later. Now we get into the meat of things. Guest Posting!!! You want visitors to your site, you need to look beyond your own blog. The best way of getting visitors to your site consists of writing content for other blogs. Huh? Think about it. If you write a quality post for another blog, and reference your blog in that post, logic would dictate you will get some percentage of those readers to click on your link. 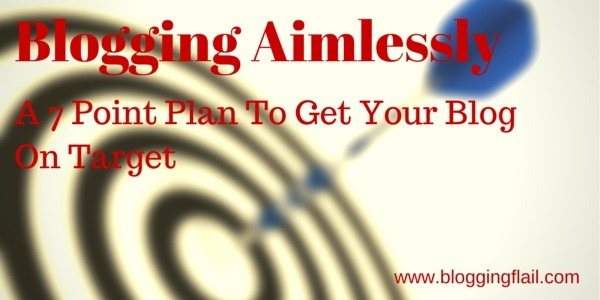 If you can land a guest post on a popular blog, think about the number of potential readers you are targeting. It’s like free advertising. This isn’t a typo, you saw this one already. I’ve included it here again near the bottom of the list, to stress the importance of this activity. For every hour you spend creating your own content, you should spend an equal amount of time networking with other bloggers. Its that important. This should go without saying, but the above activities are not linear in nature, you will need to go back and continue completing and refining these tasks. As I stated previously, I’m one of those bloggers that have been struggling. In fact I almost lost interest in this blog until just recently, and only wanted to focus on my personal blog. But I realized the error(s) I was making and decided to give it one final go. I thought it would be interesting to write about my implementation of this new strategy I was following. Give the readers a first hand perspective on what works and what doesn’t. I’ll be writing about my implementation of these various tasks, how easy they were to achieve, and most importantly the results that I’m achieving. I’d love to have you along for the ride. Interested? Well sign up for my newsletter, and I’ll keep you updated on how things are working out for me. Or simply click here to learn more. Best of luck, and by all means let me know if you have any questions or suggestions by leaving a comment below. Great post! Your networking points are exactly what I teach my clients. Thank you for commenting again Sue. Glad to know what I’m preaching is the same thing you are teaching to your clients. Appreciate the kind words. Great idea stressing networking twice – and very important to remember that networking is always proactive. Thanks for taking the time to comment Ana. I’m learning just how important networking truly is, and thought it was important enough to call it out twice. Thank you for sharing your ideas and steps. I have been blogging now for about two months and have happend on some of the steps quite by accident or at least through business knowledge. I’ve known that social networking works and have reached out to a couple of bloggers that have been successful and doing this for a while. I have to get more diligent at following them and taking up guest blogging opportunities. Again, thank you. Susan. PS: You can fine my blogs at http://susanspetblog.com/wordpress and http://susansblogtheinnersoul.com/wordpress. Thanks for stopping by and taking the time to leave a comment Susan! I honestly didn’t grasp the whole networking thing until just recently, and I can vouch for the fact that it’s working. In a few short weeks I’ve seen comments on my blog from bloggers I never dreamed would leave a comment. The points you’ve mentioned are worth reading for every blogger. I’m much familiar with relevant content, email list, guest posting and other points you’ve raised here. But, I I just stop by on networking. It’s new for me bookmark few sites that are relevant and are worthy plus leaving comment on those blog and pitch an email to owner of those sites to know about how much you’ve learned from them. It’s very interesting point you’ve raised. I’ll gonna try it. Thanks for letting us know from these tips. Thanks for stopping by Mustafa and leaving a comment. It seems so simple doesn’t it, but it’s amazing how many people loose site of this simple concept. I’ve learned so much over the past month or so just by bookmarking the sites of some great blogs, reading their posts, and taking the time to leave a thoughtful comment. By all means give it a shot. I think you’ll be pleasantly surprised on how successful you are. Well, I’m glad we’ve met this morning at my blog, as I don’t think that I’ve been here before, and I see that you know all about blogging. Ah, build it and they will come. I actually remember that’s what they used to tell new bloggers back in 2007-2008. According to them (the supposed know it all people) it was all about getting the perfect long tail keyword phrase and they would come. But that’s BS, and if it might have been true back then for some, I know it wasn’t really that way for me. To me what works best is building relationships and be more involved in social media. Once I started doing that, it started to make a world of difference in my blogging results. Thank you for the wonderful compliment Sylviane, and thank you for taking the time to stop by and comment. I’ve chased keywords and SEO on previous blogs, and while there was some success, it really didn’t lead to any engagement. I’ve got one post on this blog that ranks very high for a number of keywords related to SEO, but those readers find what they are looking for and move onto their next search. Kind of over that. I’ve recently been enlightened by the whole networking thing, Should have paid a lot more attention to that years ago, as it’s paid dividends in just over a month. [ Smiles ] Splendid pointers, Craig. You got it. You really got it. That was me up until about June 2014. I would create my content, and hit publish, and then sit back and think ‘job done’. Then I found out the job was only 50% done – the other 50% was still to do – like promoting the post, engaging, building relationships and networking. And since I have been doing all of the above, my blog has performed much better in terms of stats (I had 2 $1k+ months on the blog). But here is the problem. Many people (and I was this person myself once) simply do not understand this. The old saying ‘build it and they will come’ is not working anymore. A few years ago yes, but not in 2015 and beyond. The next problem is that even if bloggers do see this, they won’t follow through on it. Because doing some of the above means giving time to others, and in for some bloggers, there own sense of importance stops them from doing it. This strategy really does separate those who just want to take, take, take, from those that want to give. Superb post, which I’m sharing out right now. Great to see you again Richard. Thanks for taking the time to stop by and leave such a generous comment. I would do the same in the past. I was all about focusing on SEO and optimizing for keywords. I mean, why would I need help from other bloggers. Boy that was an eyeopener for me. Once I figured out the networking aspect of things, the engagement on my blog has skyrocketed. Really enjoyed your article. Your willingness to be transparent is much appreciated as you have added a lot of value for your readers here. Many times the most valuable articles include tidbits and advice from folks who are trying to warn us to avoid the pitfalls they’ve fallen into along the path that they’ve trod. Well done! Blogging aimlessly… your points are excellent, and I couldn’t agree more with each and every one of them. Your point number four about establishing an Email list is absolutely my favorite. Without building a list of subscribers it’s pretty difficult to monetize our site. I really like how you implemented a task list so that folks can take action on the powerful point she made. Excellent! Thanks for sharing, and I hope you have a wonderful weekend. Took me a while to see the value in the email list, but it’s pretty apparent now. Even though I’ve just started focusing on it more, I do have plans for that list down the road. I understand the importance, and I’m going to be working to grow that list in the coming months. Thanks for stopping by again Carol. You have a great weekend as well, and we’ll talk soon.